Everyone says that New Zealand is one of the most beautiful places in the world, so why don’t you go and see for yourself… With this New York to Auckland flight our deal hunters have found you can visit the country for $1,638 r/t with taxes. Book a ticket with China Southern Airlines in January and fly for less than with any other companies checked. 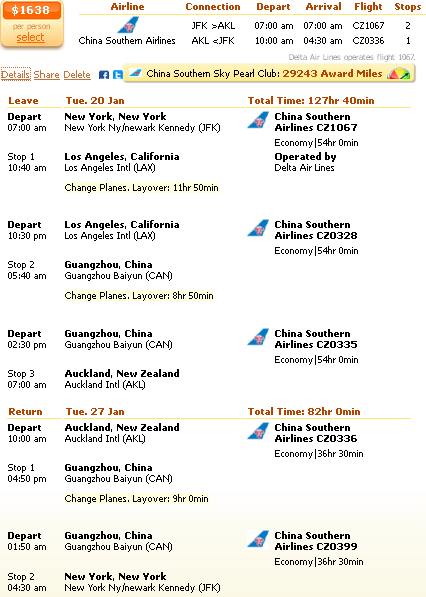 We have found this Cheapoair deal on Travelgrove, but be clever and select some of the other providers as well to see who has got the cheapest flight to Auckland for your preferred travel dates. Your New Zealand flight will depart from John F. Kennedy International Airport (JFK) on January 20 and return on January 27 from Auckland Airport (AKL). Note that the departing flight has got two stops, one in Los Angeles and one is Guangzhou while the return flight only one, in Guangzhou. The airline’s frequent flyer program, China Southern Sky Pearl Club, offers 29,243 award miles if you book this offer. If you book the deal of China Southern Airlines for $1,638 r/t you can save more than $100 on your ticket compared to the second best fare, a Cathay Pacific flight for $1,762 r/t. This entry was posted on Sunday, November 23rd, 2014 at 2:26 pm and is filed under Airfare Deals. You can follow any responses to this entry through the RSS 2.0 feed. You can leave a response, or trackback from your own site.